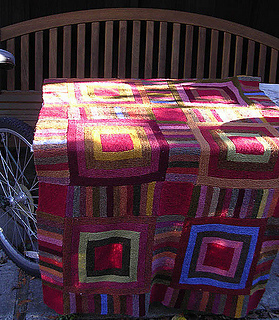 The Parcheesi Afghan is a variant of a log cabin quilt, knit in garter stitch. 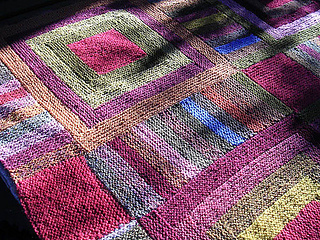 It is modeled after an antique quilt I found in a book (sadly can’t remember which book--I’d never intended to write up this pattern!). Mine was knit in Shetland jumperweight yarn--more than 30 colors were used. But you could use fewer colors and heavier yarn if you choose! The pattern is available free of charge in exchange for a donation of any size to Heifer International (www.heifer.org), an organization that works tirelessly around the world to solve the problems of poverty, hunger, gender inequity, ecological degradation, and lack of education. The recent news of food shortages and riots in many parts of the world bring new urgency to the work Heifer does, which is not short-term response to crises--Heifer works to create systemic change within families and communities. Of course, I will not be checking to see whether you have made a donation. But it took me many hours to put this pattern onto paper, so I hope you honor my work as well as honoring your own reasons to be grateful. Thank you, everyone! I’d love to hear from you if you decide to knit this project!